Dr. Rosy McCrodan is a dentist at Academy Dental. Rosy knows that a visit to the dentist can be accompanied by anxiety for some people; she believes making people laugh (even if it’s with nitrous gas!) is helpful in her pursuit to deliver compassionate dental care. Rosy loves all aspects of dentistry, especially working with children and taking out wisdom teeth. 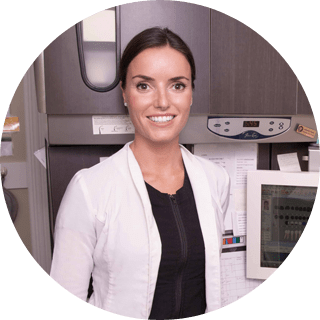 In order to evolve professionally, Rosy frequently shadows an Oral Surgeon and is involved in the South Vancouver Spear Study Club. She worked in Prince George before moving back to Victoria where Rosy was born and raised. If she’s not playing a sport, you can find her walking her German Shepherd or boating in the gulf islands. Rosy holds a Doctor of Dental Medicine Degree from the University of British Columbia.